Estimating the time required to do a job is an area where many projects have a problem. You need to be wise in how estimates are used and in turn interpreted. When used correctly, estimates can be a valuable planning tool, unfortunately they are often used incorrectly resulting in time waste and conflict. Have a look at this article on estimation and probability definitions. Scheduling enables the project organisation to create a balance between “Production” and “Production Capacity” (P/PC). Use of the Critical Chain concept enables us to focus on what is important to do before it becomes critical. Scheduling enables us to understand the relationship between different activities and the people required to carry out those activities. Use the schedule to identify potential constraints before they occur and take pro-active action to avoid or minimise the impact. 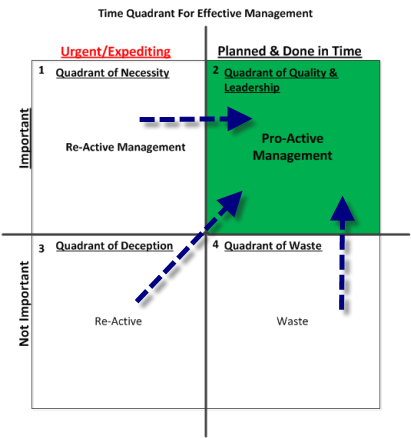 In terms of effective management of time, estimating and scheduling can be considered activities of time quadrant 2. By investing the right amount of time and effort in the planning activities of estimating and scheduling. We can prepare for and improve the likelihood of project work moving forward without unnecessary delays and re-work, thus avoiding re-active crisis management as represented by quadrant 1. Proactive style of management that uses initiative. Quadrant 3: Represents a culture where activities that are not important but individuals feel a sense of urgency to do. Quadrant 4: Represents a culture where activities that are not important but may be done because it is fun. Estimating effort and scheduling are difficult tasks, but at the same time critical to any project. Scheduling should be done iteratively and at different levels of detail. The first project schedule will be very high level and likely to have a large degree of uncertainty. I find that the use of Critical Chain Scheduling at project level and sometimes at management stage level gives me a good overview of the project as a whole. For scheduling work in Sprints or iterations you can use a Kanban board or a Sprint backlog for the production team to focus their attention. In this context the Kanban board gives you the short term planning and control perspective and is easy for everyone to understand quickly. The Critical Chain Schedule is a medium to long term planning, monitoring and control tool, often with a focus on the delivery date. What does a well-formed schedule do? Give a snapshot overview of the project plan as it was when last updated. Highlight the interdependencies between User Scenarios & Acceptance Tests/Activities as well as the people/skill groups required to carry out the work. Subordinates the schedule to people. What does a well-formed schedule NOT do? What can we use a well-formed schedule for? Create an input queue for what work should be done, enable you to schedule your priorities. To find an optimal delivery time for the project product and to communicate to stakeholders when they can expect to start a particular activity. This process has the additional benefit of enabling individuals to understand what is expected of them and when it is expected. This is an essential factor in for individual motivation and retention.